My mother and her sister were born into a middle class family in Taichung, Taiwan. There, they lived a comfortable life, though one without many luxuries, like going on vacation or attending private school. She and her family believed that in order for her to get a well paying job, she needed a master’s degree from a university in America. Thus, she spent her senior year of college at National Cheng Kung University applying to various graduate schools in the United States. As a 22 year old, my mother came to the United States to attend the State University of New York at Buffalo to study electrical and computer engineering. It was June 1992. My mother stepped off the plane into the Buffalo Niagara International airport and took a deep breath. She felt her airways open, filling with the crisp New York air. She was relieved to finally be on solid ground after spending nearly a dozen hours in an airplane, flying from the only home she had ever known to a completely foreign country. 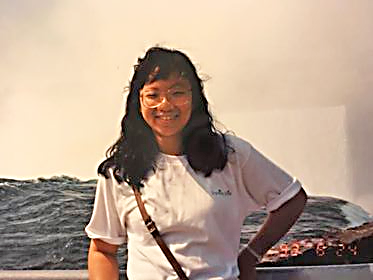 This was her very first time on an airplane, and she was traveling across the ocean to the United States, where not only did she not know anyone, but she was also not fluent in English. My mother struggled in her first few months in the United States getting acclimated to such a new environment. In addition to being away from her family for the first time, she was also thrown another challenge – learning English. In between reading the textbook for her classes, she spent every free second listening to the radio in English to practice her fluency. “And I will always love you…” Whitney Houston’s crystal clear voice belted from the radio that my mother had on her desk. She often found herself turning the dial to station 96.1, whether it be listening to Whitney Houston, her favorite artist at the time, or listening to the local news in English. Combining this strategy with making new friends who spoke English fluently, one of whom was my father, my mother was able to pick up the language fairly rapidly in the two years she was at Buffalo. After receiving her degree, she returned to her family in Taiwan. There she began her first job as an engineer at Apple. A couple months into her work, she was invited to a conference at Apple’s headquarters, in Cupertino, CA. She traveled back to the United States for the first time since being in school, and reconnected with my father, who lived in Alameda at the time. It was during this business trip that she realized she wanted to apply to some jobs in Silicon Valley, as she recognized the booming industry. She returned back to Taiwan and began to fill out her applications from there. She eventually got a job as a marketing engineer at C-Cube Microsystems in 1997. Saying a tearful goodbye to her family, she boarded a plane to California, carrying just two bags full of her most beloved belongings. My mother applied for US citizenship and moved to California, deciding to stay at her aunt’s house in San Jose, commuting to and from Milpitas. While living and working in Silicon Valley, my mother and father stayed close, eventually moving into an apartment in Fremont together. A few years later, my mother and father got married and moved to a larger house in Fremont, where I was born. Four years following that, we moved to Palo Alto, where my sister was born, and where we have remained ever since. Despite the sacrifices and hardships she faced, my mother is very grateful for the opportunities she has had in America and the life she has created for her family in Palo Alto. Though she has lost certain aspects of her old life, she believes that she has gained invaluable experiences and relationships through her immigration to the US, and would not trade it for the world. This story was written by Shanthi Deivanayagam, the daughter of Chia-Ning Yu.